In the late 1970's when Adam, Bono, Edge and Larry played their first gigs in Dublin's Northside, there was only one music title that would follow them all the way. Hot Press Magazine was at the scene from schoolroom to stadium, Dublin bars to New York clubs, Out of Control to Under A Blood Red Sky. Introducing North Side Story - a unique, ringside seat at the rise and rise of U2 in their home city. An exclusive publication, commissioned from the Hot Press team in Ireland, this large-format 274-page book is full of rare and unpublished photos, reviews, interviews and original band pieces from the time. Over the past six months Hot Press have tracked down many of the original players in the U2 story - schoolfriends, musicians, artists, promoters, DJ's and crew. Along with their unique archive of original content, North Side Story features dozens of new interviews - from Paul McGuinness and Guggi to Jim Sheridan and Steve Lillywhite - bringing the story of the band right up to date. The editorial lens is pulled back further with first-time translations of some of the earliest interviews the band gave as they embarked on dates around Europe. Open up North Side Story and you'll find a beautiful pull-out wall-map, capturing landmark moments in U2's Dublin from the early years to the present day. 'North And South of the River, Wandering In U2's Dublin' has been commissioned from U2's long-time design team. It's been a remarkable project, says Niall Stokes, Hot Press Editor, whose writers, designers and photographers' have produced the book. 'Watching Feedback play in 1976, no-one could have dreamed of what lay ahead. We've ended up with a roller coaster, blow-by-blow account of the band's earliest days, telling the story of the genesis of U2 in a unique, powerful and, I hope, fantastically captivating and revealing way. Along with this special annual gift, subscribers access a range of other benefits including exclusive music, editorial content and as usual, access to take part in ticket presales if the band announce a tour. 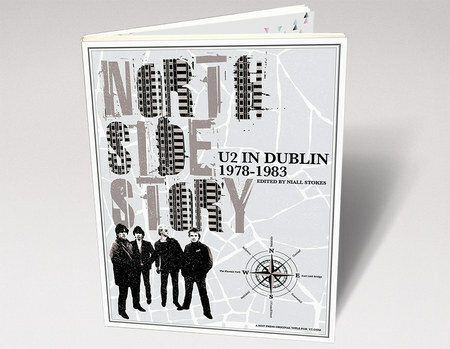 North Side Story is a limited edition publication by Hot Press for U2.com. It's only available when you subscribe. If you are a current subscriber, click here to renew.